While the S-Cam 3 programme has increased the field coverage so that single objects can be observed in reasonable or even poor "seeing", while still being able to observe the surrounding sky background, the single pixel approach will be always limited. Clearly with each pixel requiring its own wiring and readout electronics an expanded array cannot ever hope to be able to cover a significant field. In addition larger dimensioned pixels introduce serious degradation in performance. The solution that is planned to be introduced in S-Cam 4 is the Distributed Read Out Imaging Detector (DROID), based on the original concept developed by Kraus et al. Essentially photons are not absorbed directly in the STJ but in a superconducting absorber strip. The resultant charge carriers diffuse along the strip until they reach each end where they are trapped by a lower energy gap material and enter the STJs. The field coverage envisaged in the SCAM-4 programme. 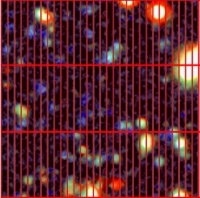 A 1x1 arcmin sized deep field exposure from a CCD camera at the WHT prime focus is used as background. The sum of the two STJ signals provides the energy of the photon while their ratio is a measure of the position in one-dimension, the second dimension being simply the width of the strip. Such systems have been tested successfully at optical wavelengths. Packaging such individual DROIDs into arrays (as shown alongside) will allow large field coverage. This particular example shows an array of 3x30 DROIDs, requiring <200 wires, superimposed on a 1x1 arcmin field. The optimum geometry and structure of the individual DROID building blocks is presently under investigation.